As you all know I do cook A LOT of meat, but I do cook a lot tasty slides as well. Meat hogs all the glory. Cooking sides on the grill or smoker is really easy, just takes a little prep, toss it on the grill and let the magic happen. 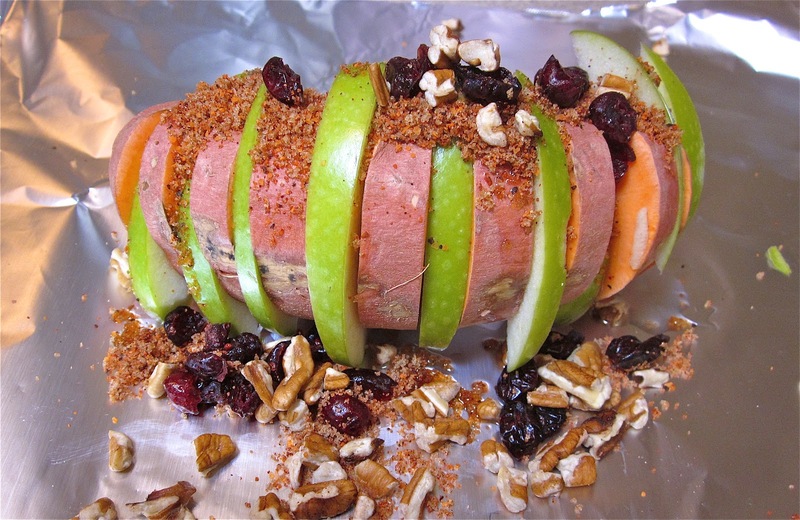 Today I’m going to feature a side I cooked up for our Easter Feast, Baked Sweet Potatoes. I had planned for this sweet potato to be part of my Easter Ham post but I forgot to take pictures of the ham during cooking and pretty much ruined it, I had a catchy title and everything all worked out. Little did I know, that the humble little sweet potato would end up stealing show and becoming the true star of the meal. 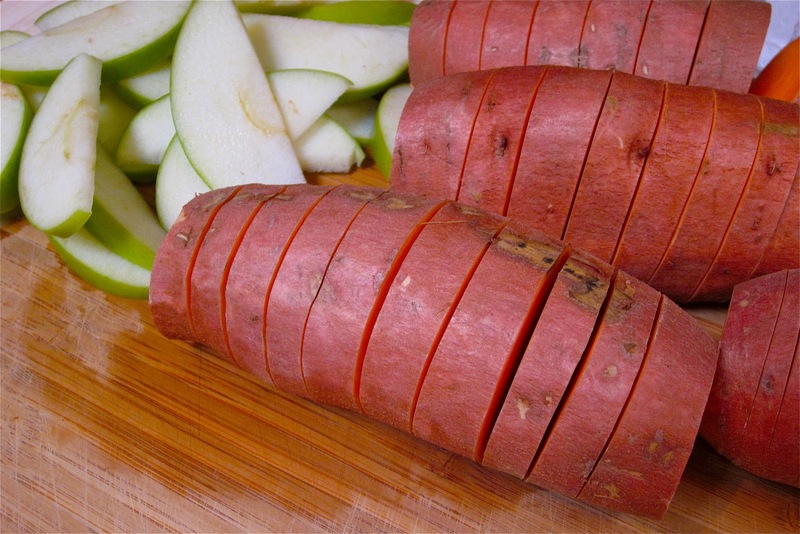 I started by taking a nice sweet potato and slicing it about 3/4 way through the potato about 1/4 inch apart. Then I sliced a fresh green apple in to thin wedges and placed the wedges between the cuts in the potato. Place the potato & apples on sheet piece of foil, drizzle with a little vegetable oil, or if you feel like living dangerously use some butter. Then I topped with pecans, craisins and a mixture of brown sugar my BBQ Rub, 2 parts brown sugar to 1 part rub. Wrap up the package and place is on the grill or smoker. I was smoking a ham at 250º, so I cooked the sweet potatoes for about 2 hours. Cooking it on the grill at 400 will take about an hour. 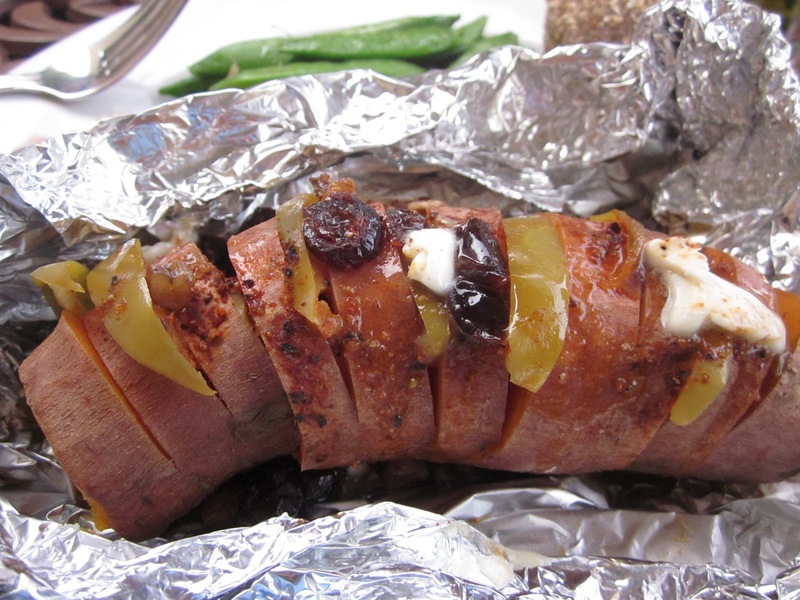 Once it’s done remove the sweet potato and dump the contents of the foil pouch on top, be sure to get all those nuts, craisins and the spicy brown sugar sauce on the potato. In retrospect the baked sweet potato was the highlight of the meal. The potato was soft and had absorbed all the flavors from the apple, craisins and brown sugar rub. The cooked green apples paired nicely with the potato and the pecans brought a contracting crunch to the party. By far the best flavor came from the craisins, during the cooking they plumped up with all those amazing flavors floating around in the bottom of the pouch. It was so dang good I forgot all about the ham pictures. What a great idea! 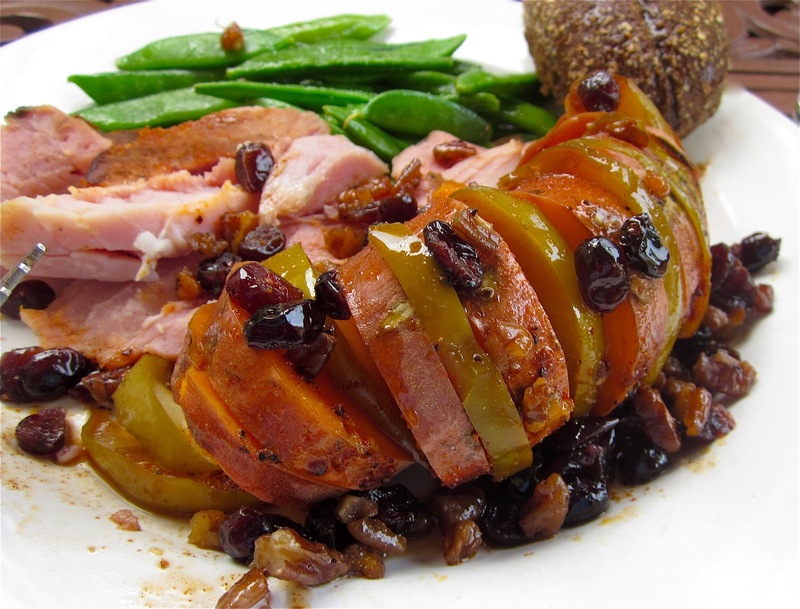 One of the most clever hasselback potato recipes I have seen, Kirk. Thanks ChrIs, now I know what it's called.